Let’s just start by saying that Kelsey Finkelstein has some lofty expectations for High School. Surrounded by her 3 BFFs she sets out to accomplish some serious image building. Yet, as you might imagine, things take a turn for the worse as soon as the first day of school begins. Bullies, misunderstandings, and boy trouble quickly become the norm as Kelsey must fight to salvage her year. 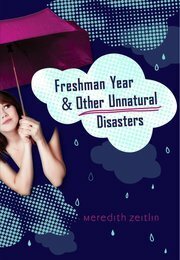 Probably the thing we liked best about Freshman Year and Other Unnatural Disasters was the way the novel captured the High School-ish feel and everything that goes along with THAT. The drama at school felt real. The overreacting and misunderstandings amongst friends came across as genuine. Even the oft delicate relationship between parent and teen was reminiscent of years gone past. We also enjoyed reading about the numerous misadventures of Kelsey. Whether it was on the soccer field or the stage, nothing came easy. It’s also very difficult to write a character with so much frustration, yet Meredith Zeitlin managed to keep the main character likable throughout. The dialogue at the beginning was a little forced while trying to acclimate the reader to the story, but once things got going the plot contained plenty of unpredictable commotion to keep things interesting until the very end. Editors Note: This book was generously provided as an advanced review e-book. I m always Looking for these kind of stuff, Sharing these kind of information is really helpful to all.Your blog is really nice simple and always provide valuable information to all users.Thanks a lot ! Now everyone have to concentrate on quality instead of quantity and create unique and readable content instead of publishing same content in many places to get rankings.